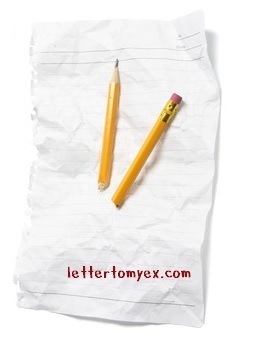 Letter To My Ex > Letters > letters > I wish you well > I’m a fool. I don’t expect a reply or anything like that. I just hope you respect me enough to read this when you have the time so you can really understand where I am coming from. You know I am sorry, and right now I am paying for my actions. I’ve made some stupid mistakes during our relationship that I can see now. I’ve been blind, naive and childish throughout our whole relationship thinking that I could get away with the things that i’ve said and the things that i’ve done. I am really at a loss of what to make of the situation we are both in now. I can only reflect on my mistakes and learn from them so in the future I don’t make the same ones again. Right now, I understand you are protecting yourself from being hurt more by me and I completely understand that. I can’t change your mind, but I just want you to know I care about you more than anybody else in this world. I’ve loved you more than I’ve ever loved myself and I know you got to that point with me as well.. I got too comfortable with the fact that we had so much planned for our future, I kind of forgot that you needed affection off me and it wasn’t just me that needed the reassurance. Yes, it’s stupid that I’m doing it now because I realise I don’t have you, but speaking to different people and getting advice just shows that it was me all along. I was the one slowly killing what great we had. The lies you always told me were to protect yourself from me and that’s not how I wanted it to ever be – I care for you a lot and i know you cared for me at one point – you suffer with bad anxiety and in my mind, a few things you did had me questioning why you would do it. I wish you would understand that I honestly never wanted to be controlling, you thought I was but it was only because I cared. I would have done anything day and night for you Al, you could / can always reply on me. I get that being needy and obsessive is unattractive and that’s probably why you really don’t want me back.. But I realise I lost myself, I don’t even know who to be or how to act right now because I’m only just coming to terms of what’s actually happening. You’ve given me everything! Your absolute all, been my rock and my best friend for 3 years. I understand you’re tired and exhausted now and I don’t blame you, haha I don’t blame you at all in fact, I appreciate and worship the ground you walk on. You’re making this decision for you right now because that’s how you feel.. all I wish is that you’d respect how I’m feeling too… If I could put in words how much I love you and how the connection I have with you is out of this world I would.. but I can’t right now as I’m full of anger and plus I don’t think it’s the right time to express that to you. I realise i’m not the only one hurting – you are too but you just have better ways to deal with it. I’ve hurt myself the most by contacting you, pushing you further away and probably making you feel some sort of hatred towards me. I never wanted it to lead to this.. I really did want to spend the rest of my life with you. I really believed you were the one for me. I now realise that maybe the connection we share is a true feeling, but maybe I’m just not the one for you. Now I guess we have to act as strangers? Where I have to pretend that I don’t care about you, that you aren’t on my mind 24/7, that I don’t want to know about what happens in your life, that I don’t miss you.. That I don’t love you. I respect your decision Alex, I just hope you respect mine that it’s not my time to let go yet. You are my sweetheart, I will never ever forget the things you’ve done for me, the way you’ve made me laugh.. wow we have had some really good times together (also thank you for Italy – best experience of my life and i’m so happy to have shared that with you and your amazing family) and the way you’ve reassured me and comforted me through our whole relationship. I’ve ruined something that could have possibly been the best thing to have ever happened to us both. I’m sorry if you feel that way too and have had to end this, not because you want too but because you have to due to my actions. I hate you, but not as much as I hate myself because I would take you back in a heartbeat despite it all. I will always be a phone call away if you ever need anyone… I’ll never forget these 3 years Al, but I guess it’s now time for us to both move on with our lives.